(Nanowerk News) Pioneering a novel microscopy method, neuroscientist Arthur Konnerth and colleagues from the Technische Universitaet Muenchen (TUM) have shown that individual neurons carry out significant aspects of sensory processing: specifically, in this case, determining which direction an object in the field of view is moving. Their method makes it possible for the first time to observe individual synapses, nerve contact sites that are just one micrometer in size, on a single neuron in a living mammalian brain. Focusing on neurons known to play a role in processing visual signals related to movement, Konnerth's team discovered that an individual neuron integrates inputs it receives via many synapses at once into a single output signal -- a decision, in essence, made by a single nerve cell. The scientists report these results in the latest issue of the journal Nature ("Dendritic organization of sensory input to cortical neurons in vivo"). Looking ahead, they say their method opens a new avenue for exploration of how learning functions at the level of the individual neuron. Dendrites of a nerve cell in brain appear like branches of a tree. Left: A patch clamp pipette injects fluorescent dye into the cell. When light falls on the retina of the human eye, it hits 126 million sensory cells, which transform it into electrical signals. Even the smallest unit of light, a photon, can stimulate one of these sensory cells. As a result, enormous amounts of data have to be processed for us to be able to see. While the processing of visual data starts in the retina, the finished image only arises in the brain or, to be more precise, in the visual cortex at the back of the cerebrum. Scientists working with Arthur Konnerth -- professor of neurophysiology at TUM and Carl von Linde Senior Fellow at the TUM Institute for Advanced Study -- are interested in a certain kind of neuron in the visual cortex that fires electrical signals when an object moves in front of our eyes -- or the eyes of a mouse. When a mouse is shown a horizontal bar pattern in motion, specific neurons in its visual cortex consistently respond, depending on whether the movement is from bottom to top or from right to left. The impulse response pattern of these "orientation" neurons is already well known. What was not previously known, however, is what the input signal looks like in detail. This was not easy to establish, as each of the neurons has a whole tree of tiny, branched antennae, known as dendrites, at which hundreds of other neurons "dock" with their synapses. To find out more about the input signal, Konnerth and his colleagues observed a mouse in the act of seeing, with resolution that goes beyond a single nerve cell to a single synapse. 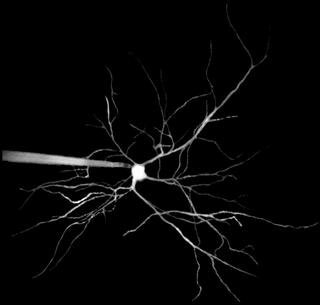 They refined a method called two-photon fluorescence microscopy, which makes it possible to look up to half a millimeter into brain tissue and view not only an individual cell, but even its fine dendrites. Together with this microscopic probe, they conducted electrical signals to individual dendrites of the same neuron using tiny glass pipettes (patch-clamp technique). "Up to now, similar experiments have only been carried out on cultured neurons in Petri dishes," Konnerth says. "The intact brain is far more complex. Because it moves slightly all the time, resolving individual synaptic input sites on dendrites was extremely difficult." The effort has already rewarded the team with a discovery. They found that in response to differently oriented motions of a bar pattern in the mouse's field of vision, an individual orientation neuron receives input signals from a number of differently oriented nerve cells in its network of connections but sends only one kind of output signal. "And this," Konnerth says, "is where things get really exciting." The orientation neuron only sends output signals when, for example, the bar pattern moves from bottom to top. Evidently the neuron weighs the various input signals against each other and thus reduces the glut of incoming data to the most essential information needed for clear perception of motion. In the future, Konnerth would like to extend this research approach to observation of the learning process in an individual neuron. Neuroscientists speculate that a neuron might be caught in the act of learning a new orientation. Many nerve endings practically never send signals to the dendritic tree of an orientation neuron. Presented with visual input signals that represent an unfamiliar kind of movement, formerly silent nerve endings may become active. This might alter the way the neuron weighs and processes inputs, in such a way that it would change its preferred orientation; and the mouse might learn to discern certain movements better or more rapidly. "Because our method enables us to observe, down to the level of a single synapse, how an individual neuron in the living brain is networked with others and how it behaves, we should be able to make a fundamental contribution to understanding the learning process," Konnerth asserts. "Furthermore, because here at TUM we work closely with physicists and engineers, we have the best possible prospects for improving the spatial and temporal resolution of the images."